My oldest kiddos are almost seven years old and they claim that I have NEVER made them meatloaf. What a mean mommy! That is, of course, not true. I have made meatloaf… just not in a really, really long time. Meatloaf can get a bad rap but, with a few little additions, meatloaf can be really delicious and something to please both the kids and the adults. For this recipe, the main ingredient – beef – was very local. We don’t eat a ton of red meat, but when we do, I like to know that the cow was hanging out in NC before it came to our table. Brandon and Lisa Higgins at C-Saw Hill sent this ground beef my way last month and it was just the right amount to make a small meatloaf for our gang. 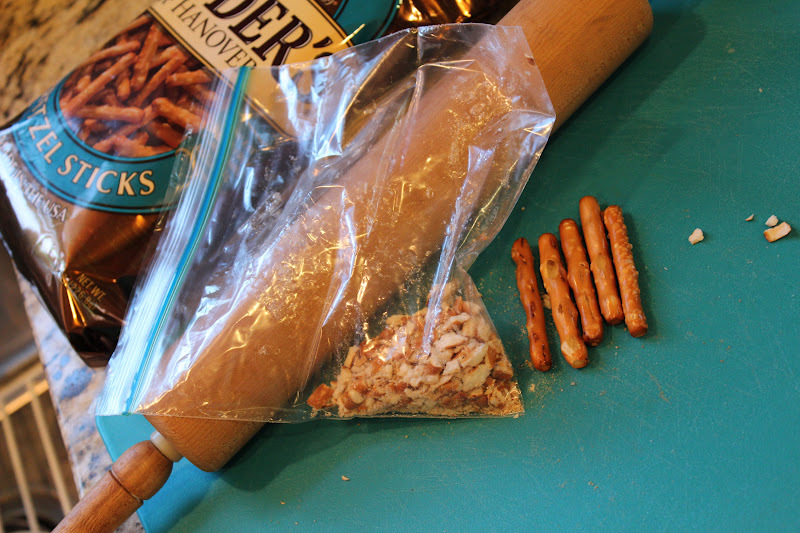 My dad always tossed in Pepperidge Farm stuffing (from the blue bag) into his famous meatloaf but since we are gluten free, I crushed up some gluten-free pretzels from Snyders to add some “crunch.” I placed a handful of pretzels in a ziploc bag and bashed them a bit with a rolling pin – a great job to keep the kids busy for a few minutes as long as they don’t try to bash each other. With just a few more ingredients, you’ve got a delicious crunchy, cheesy meatloaf! 1. Lightly grease a loaf pan and preheat oven to 350 degrees. 2. Dump all of the ingredients into a large mixing bowl. 3. Using your hands, combine the ingredients. 4. Form it into a bread shape in the loaf pan. I like to lightly sprinkle coarse sea salt and freshly ground pepper over the top of my meatloaf before I toss it into the oven. 5. Cook for 45 minutes to an hour. Enjoy! Some notes … Meatloaf can be prepared well ahead of when you actually want to cook it. Prepare it the night before or even make several smaller separate loaf pans and freeze some. In our house, one pound of ground beef fed 3 adults and 4 children at dinner but if your family likes larger portion sizes, you might want to make more! That looks great! I will have to try gf pretzels with my meatloaf. I have been using cooked brown rice as a gf breadcrumb substitute. It’s got to be good if it’s from C-Saw Hill!